Daniel Russel, a high-level US State Department official, provides a glimpse into the Obama administration’s expectations and concerns in the lead-up to Burma’s landmark vote. The world is watching as Burma prepares for a general election in November, which is hoped to be the country’s first free and fair poll following decades of military dictatorship. The former pariah state began a turbulent transition to civilian rule under the leadership of President Thein Sein in 2011, though the armed forces remain entrenched in the country’s politics and the population of more than 51 million still struggles with the legacy of civil war, poverty and a fractured sense of national identity. Under the administration of President Barack Obama, the United States, which was among a number of Western powers to ostracize the former junta with economic sanctions and broken diplomatic bonds, has re-imagined its policy in light of recent reforms. Since restoring bilateral relations in 2012, Burma has become a key component of the administration’s “Asia pivot,” a policy geared toward closer ties with the greater Asia-Pacific region. The Irrawaddy spoke at length with Daniel Russel, assistant secretary of state for East Asia and Pacific affairs, at the end of his three-day visit to Burma, during which he met with senior government officials, civil society actors and ethnic minority representatives to assess the political climate and prospects for further reform. Conveying both optimism and a touch of reproach, the senior State Department official provided an illuminating glimpse into the administration’s expectations and concerns in the lead-up to Burma’s landmark vote. I understand that you met with Union Election Commission [UEC] Chairman Tin Aye, senior ministers Aung Min, Soe Thane and Ko Ko, as well as opposition leader Aung San Suu Kyi. Could you tell us a bit about those meetings? I also met with a variety of stakeholders, youth leaders, religious leaders, political activists, and I met with a cross-section of specialized agencies and NGOs that are providing election support and training, monitoring, etc. Let me start with the reason I came here, which is that the success of what I call ‘the Burma experiment,’ the reform effort, is really important to the United States, and the upcoming elections, frankly, are the acid test of that reform effort. This is a process, or a milestone in a process, that should allow the citizens of Burma to shape their own future. The message that I brought to everyone in the government and to the election commission chair [Tin Aye] is that the whole world is watching. We care immensely about the process leading up to the election and the conduct of the election itself, as well as, of course, the acceptance and the implementation of the will of the people, the results of that election. And it’s important that all the players in Burma recognize that. We want to encourage them all to do everything in their power to add to the transparency, inclusivity and the credibility of these elections; to make them free and fair in the eyes of the people of Burma and the international community. I was able to go through a number of questions with the chairman of the UEC and the home [affairs] minister and other officials, probing their plans for election prep. That included digging down on the ways in which they will balance safety and security on the one hand, and freedom and access on the other. That included our questions and concerns about enfranchisement or disenfranchisement, including that of religious minorities. I asked about the voter lists, and probed about the steps that they will take to improve the accuracy and transparency, so that 2015 will see a credible voter list. I probed heavily and, frankly, shared our concerns on the growing infusion of religion in the political arena—the perception that there is a politicization of religion in the country that raises flags, frankly, and certainly works counter to the stated goal of a more unified Burma. I also raised the question of how the advanced voting of the military will operate, because it is a given that great suspicion and skepticism will be attached to any irregular or extraordinary voting arrangements for the military. That was very much a problem in 2010, and I probed upon the steps that the UEC and others can take to ensure that there is enough transparency and enough good procedure in what is a legitimate challenge; namely, getting active-duty military officers to vote through the deployment of international observers and other mechanisms. I’d like to back up a little bit and talk about disenfranchisement. There have already been questions raised about the credibility of this election because of the disenfranchisement of hundreds of thousands of people, particularly in Arakan State, and also what at this point appears to be the deliberate disqualification of Muslim candidates. I raised very directly our concerns about the decision to preclude white card holders—the Rohingya—from participation in the election. I also flagged that we in the United States and in the international community are tracking very carefully the wildly disproportionate number of Muslim candidates who, at least on a preliminary basis, have been disqualified. I know that there is a review process, and I made clear that we are watching that very carefully. The Burmese are setting the rules for their own election—it’s their election, not ours—but I tried to underscore the bigger point that the goal of a stable and secure Burma depends on not only the integration of the ethnic groups but of all religious groups as well. And that a fundamental responsibility of any government, particularly a democratic government, is protecting the rights of all of the people, all of the citizens, regardless of religion or other considerations. As you said, the Burmese government makes up their own rules for their own elections, but is it possible to have a free and fair election in a context where so many people are excluded? There are significant questions that need to be addressed. The disenfranchisement of the Rohingya is a particularly serious issue, given their ability to vote in the past, that raises serious questions about the inclusiveness ‎of the elections. That is a significant defect in the political procedure here, as is the constitutional clause that accords 25 percent of the Parliament to the military. This is far from a perfect system. The candidates who are contesting in the election, the main opposition party, the NLD [National League for Democracy], Aung San Suu Kyi herself, are clear-eyed about the terms under which they are competing. There are some significant structural shortcomings in the Burmese system, we all know that. This is a transitional election. This is a step in a process of two steps forward—and I’m sorry to say—one step backwards, in the direction of the kind of democratic system and credible institutions based on rule of law and good governance that we, and so many people in Burma, want to see built. But they have a hell of a long way to go. We are committed, from President Obama on down, to helping those who are willing and determined to advance the cause of democracy, good government, free market economy. That does not, however, mean for a moment that we’re willing to turn a blind eye to the problems. We are realists. There’s a big difference between being a realist and being a cynic. We’re not cynical and, frankly, no one who comes to Burma and talks to the young people, or talks to the political activists, or journalists, or members of civil society, as I have done, can come away with any feeling other than awe and hope for their success. I would also say that nobody who comes to Burma and has a serious round of consultations or takes an honest look at the situation here can fail to appreciate how immensely complicated it is. This is a daunting challenge; there are tremendous hurdles to clear in terms of ethnic divides, the legacy of six decades of military dictatorship, the effort to achieve a ceasefire, developmental challenges—there’s a very long list. I admire the bravery and the determination of the Burmese people, and I believe, from Ambassador [Derek] Mitchell and from the Embassy here, the US and international organizations providing technical assistance and support to both the authorities and the parties in the effort to help engineer credible elections, that we are all assisting that noble cause. You mentioned the ceasefire talks, and I know that you met with some of the ethnic armed group leaders as well as Aung Min [the Burmese government’s chief peace negotiator]. Yesterday [Friday] you said that you had ‘great hope’ for a nationwide ceasefire, so we want to know exactly what that means and how these talks went. The United States has been following these negotiations very closely. A stable Burma with secure borders at peace is a priority for us. We have provided moral support and political encouragement, as well as assistance for the negotiations and civil society supporting efforts to achieve peace. But these are tough negotiations. They’re negotiations between the government and multiple groups with competing priorities and varying histories. I certainly have the impression that a lot of progress has been made, and that a growing momentum is visible in the direction of a comprehensive ceasefire agreement, but there will undoubtedly be big hurdles. There is an important high-level meeting planned between the government and key ethnic leaders next week, we’ll have to see how far they get. I detected determination on the part of both the government negotiators and the ethnic groups to try to reach an agreement. It will require a combination of resolve and flexibility. 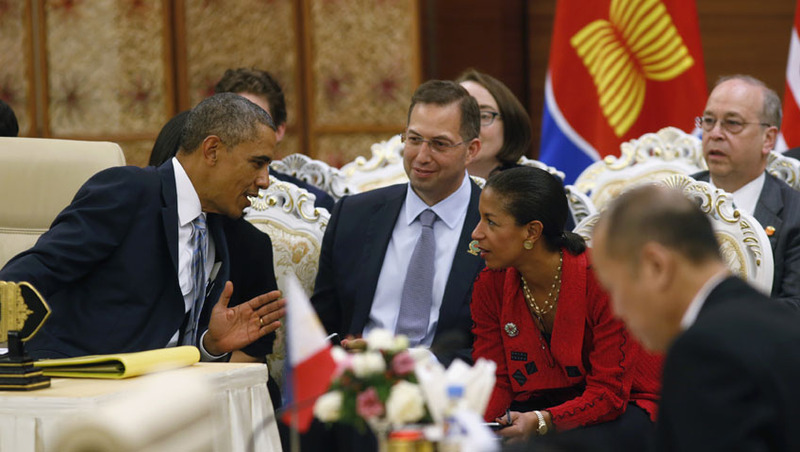 US President Barack Obama, left, speaks with US National Security Advisor Susan Rice, second right, at the 2nd Asean-US Summit in Naypyidaw on Nov. 13, 2014. Looking on are US Ambassador to Burma Derek Mitchell, center, and US Assistant Secretary of State for East Asian and Pacific Affairs Daniel Russel, rear right. I also want to talk a bit about the ‘race and religion protection laws,’ which were recently enacted. The State Department has been consistently critical of these bills, and I’m aware that there was some sort of legal review carried out. Did that review find that these laws actually do violate Burma’s human rights commitments, and if so, are there any consequences to enacting them? It remains to be seen how the laws will be implemented, and I don’t have a report on a review. But I left the senior Burmese officials that we met with in absolutely no doubt that we are troubled by the passage of these four laws and their implications. The national identity of Burma is the fundamental question of 2015. I think the election is, along with the ceasefire agreement negotiations, an indicator that Burma is engaged in an effort to build a consensus on its national identity. That’s true in a political sense and it’s true in an ethnic sense and it has to be true in a religious sense as well. I made the point that, like the United States, Burma is a union, and it would be a tragedy if, in the face of the tremendous effort being made to forge political and ethnic unity, the country was divided along religious lines. I’m realistic in that these bills have passed the current Parliament, but I certainly hope that they will be revisited in the new Parliament, and that in the meantime no law should be implemented in a manner that violates the fundamental human rights of any Burmese citizen. There’s really only one architect: His name is Barack Obama, and he had a number of people on his staff. I was one of them. So you’ve overseen the re-engagement with Burma and a lot of other countries in the region from the start. What was surprising, how important is Burma to this policy and how might it be affected by a change of leadership in the United States? I think the overall strategy of the Obama administration toward the Asia-Pacific region is rooted solidly in US national interests. On that basis, it has won widespread bipartisan support in the United States and the US Congress. So I wouldn’t expect the policy to change, regardless of who takes office in 2017. One major element of President Obama’s strategic engagement with the region has been support, respect and help for Asean as an organization, and for the 10 members of Asean as nations. This region, Southeast Asia, is a tremendously dynamic part of the world with an immense amount to contribute to the regional and global economy. The youthful demographics of Southeast Asia, particularly Burma, offer huge growth opportunities. That’s why we are investing so heavily in the young people in Southeast Asia through a range of initiatives, including the YSEALI [Young Southeast Asian Leadership Initiative] program and the Fulbright, Peace Corps, that sort of thing. One of the biggest surprises for me, vis-à-vis Burma, is the fact that the push for change, the pressure for reform and the commitment to move steadily in the direction of a democratic system, comes from within. Without a doubt, the ostracism and pressure heaped on the junta over the years made an impact, but the transformation that we are seeing—albeit in fits and starts—is a function of decisions being made by Burmese on the basis of their own assessment of their national interests. The hunger that you feel when talking to Burmese [people] for Western help, and for universal values, is so powerful as to be inspirational, I think. That fuels our determination to help. Another big surprise, I’ll be confessional about it, is how very complex the social, cultural and political situation in Burma is. This is a complicated society faced with very formidable challenges. But there is a critical mass of people in the body politic and the community who are determined to jettison the failed policies of the past, and to build a future that empowers citizens, that creates opportunities for sustainable and distributed economic growth that is inclusive and will promote integration with Asean. I think the Burmese push for independence, and their desire to avoid being left behind by others in Asean, was also a motivating factor. Whatever lies behind it, the United States and other democracies feel a responsibility to aid those that are determined to promote that political and economic transformation. We wish them well. Top Photo - (Reuters) US Assistant Secretary of State for East Asian and Pacific Affairs Daniel Russel in Phnom Penh on Jan. 27, 2015.